Announcement Welcome to meredith host ceramics. Thank you for buying handmade! Welcome to meredith host ceramics. Thank you for buying handmade! handmade terra cotta oval dish. Meredith Host. 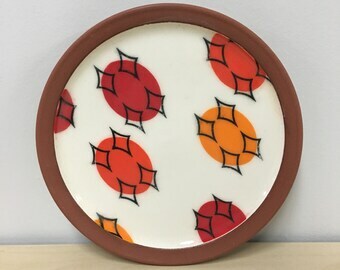 mid mod plate. handbuilt plate. decorative tray. modern home decor. modern catch all tray. handmade porcelain oval dish. Meredith Host. mid mod plate. handbuilt plate. decorative tray. modern home decor. modern catch all tray. Retro Porcelain Ashtray. vintage ashtray. mid mod. smoking accessory. smoker gift. stoner gift. mid century ashtray. modern ashtray. I'm keeping this one! Love it. Thank you, beautifully made mug. 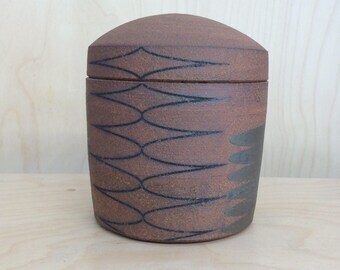 handmade porcelain mug: Dot Rounded Square. Meredith Host, mid mod, coffee mug, polka dot, handmade mug, gift for mom. modern home decor. meredith in the studio decorating mugs. decorating a dinner plate with paper stenciling. bowls ready to be glazed. Meredith Host was born and raised in Detroit Rock City and received her Bachelor of Fine Arts in Ceramics from Kansas City Art Institute in 2001. Meredith has spent time at numerous ceramic residencies including The School for American Crafts at RIT in Rochester, NY, Watershed Center for the Ceramic Arts in Newcastle, ME, and Dresdner Porzellan Manufactory in Dresden, Germany. At Watershed, Meredith was the 2005 Salad Days Artist where she designed and produced 500 salad plates for their annual fundraiser. In 2008, she completed her Master of Fine Arts in Ceramics from The Ohio State University. 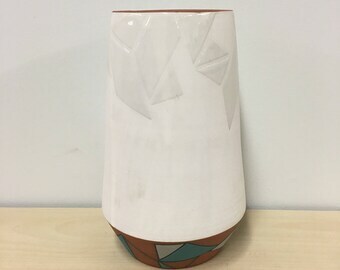 In 2011, Meredith was named one of the National Council on Education for the Ceramic Arts (NCECA) Emerging Artists as well as one of the Ceramics Monthly Emerging Artists. Meredith lives in Kansas City, MO where she is a full time studio potter & also works on her foldedpigs commercial line. She feels really awkward writing in the 3rd person. Thanks for checking out my shop! Visit www.meredithhost.com for more images of my work and info about me. Please feel free to contact me if you have any questions. As I said before, I take great pride in my packing abilities! Out of a few thousand packages or so (check my sales in my other shop: http://foldedpigs.etsy.com) I have only had a couple items break. I blame the post office. Ha. If for some reason your order arrives broken, I request an image of the broken item and will ship out a replacement as soon as possible. Shipping is on me! I accept payments through etsy's direct check out & paypal. Your order will not be shipped until your transaction is completed and paid for. If paying by e-check, I will wait for the check to clear before shipping. This usually takes 3-4 business days on average. Please make sure your shipping address on Etsy is correct. This is the address I use for all my shipping. I will use the Etsy address unless told otherwise. If you would like your order sent to a different address than the one you have listed for shipping, please leave me a note of where you would like it shipped in the comments section of your order or convo me with the address. I ship Monday - Friday...if an order comes in after 9am CST on a shipping day, it will be shipped the next shipping day. For orders in the US, I ship with USPS priority mail with delivery confirmation. If you’d like a shipping upgrade or insurance, convo me and I can send you a paypal invoice for the overages. For larger orders, I may choose to ship via UPS Ground. It’s more economical for you! GIFTS! If the order is a gift and is shipping directly to the recipient, either through convo or comment section, let me know if you’d like a little note in the package so they know who to thank! I do ship internationally! Not all my listings have international options so please convo me with your location and the items your interested in for a shipping quote. International shipping can get really pricey because of the weight of the ceramics. I try to ship first class international whenever possible to keep the shipping costs down, but packages over 4 pounds must be shipped international priority mail. It’s not my rule, it’s USPS! International customers are responsible for all fees, taxes, and duties/custom charges associated with shipping to their respective countries. I am not responsible for breakage that occurs because of customs checks. I take great pride in my packing skills! Your order should arrive safely! Your new piece will be packed with bubble wrap & peanuts so it is safe & sound.